William Westcott Boddington was born November 22, 1910 in Jersey City and grew up north of New York City. He was a tremendous all-around athlete with a wiry frame and great strength and stamina. A fine lacrosse and soccer player, Bill became intrigued by field hockey in his early 20s. Men’s field hockey had been an Olympic sport since 1908, but not until 1932 did U.S. athletes begin taking it seriously. The sport was moved forward by coach Henry Greer, who organized matches and began scouting for players on the eastern seaboard. The best players were experienced in lacrosse and shinny. Greer coached the Rye Field Hockey Club. Bill played for the newly formed Westchester Field Hockey Club. 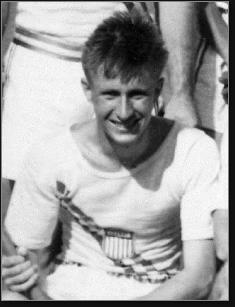 He made the team and traveled west with the U.S. team to the 1932 Olympics in Los Angeles. Along the way, he amazed teammates by descending to the bottom of the Grand Canyon hand-over-hand on a water pipe. In the opening match, inexperienced and totally untested Team USA lost to japan 9–2. Next came India, the defending Olympic champions. The Indians had won gold in 1928 without allowing a single goal. With the score 5–0, Bill broke the streak with a blistering shot past the Indian goalie. India then went on to score 19 unanswered goals. Because Japan and India were the only countries that sent field hockey teams to the Summer Games, the Americans actually won a bronze medal. The 1936 Olympics, in Berlin, saw a total of 11 teams enter, the Americans went down in flames, losing all three of their matches and scoring just twice. Bill did not score either of the goals. An accomplished skier, Bill enlisted in the army in 1941 and trained in the mountains of Colorado for an elite unit that could fight in high altitudes. In 1942, he was one of the founding officers of the newly formed 10th Mountain Division, which battled German units in Italy. Ironically, his Olympic visa had been signed by Adolph Hitler. Bill served in the same regiment as legendary track coach Bill Bowerman and they became lifelong friends. He was awarded a bronze star for his heroic actions. Bill’s love of the mountains brought him to the American West after the war. He started a lumber company in Colorado Springs and became the first soccer coach at Colorado College. At the time, the sport was barely an afterthought in the state. Its popularity there began when Bill began tutoring the Tigers. Eventually both of his sons played for the school, and it was Bill who hired Horst Richardson, who went on to coach Colorado College for four decades. Bill passed away in Colorado Springs in 1996 at the age of 85. In 1999, a soccer tournament, hosted by Colorado College, was named in his memory. The Westchester Field Hockey Club is still going strong, 80-plus years later, although all of its players are now of Dutch origin.